After buying a couple in-car FM transmitters for my mp3 player I’ve come to the conclusion that you have about 12 months to use them until they break. After 12 months the first one I purchased literally broke into pieces, FAIL. 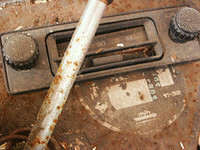 A good friend of mine Jeff purchased a Carmen Car Audio Player and had been happy for well over a year. But now it too has fallen to pieces! However, for $15 to $30 you might be satisfied with around 12 months worth of service. If that’s the case here are the top sellers on Amazon. I’ve used the first two personally and like I said, you’ll get around 12 months out of them. Now keep in mind it’s very hot where I live. The heat inside my car during the day has got to take a toll on the plastic this transmitters are made out of. Yes this set up will even work on this radio.. but if you have a radio this old seriously it’s time to move on. 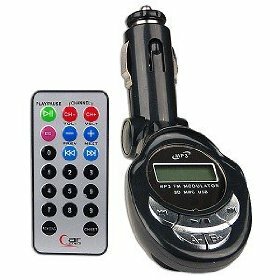 I’ve gone through several in-car FM transmitters which I won’t even tempt you with by listing them here. Bottom line some work well some work umm not so well but the Pro Ebiz Fm Transmitter with Remote works like a charm for only 12 BUCKS! Insane I know.. but trust me it works! This Transmitter has the power to push out other nearby stations and reach the antenna on the back of my suburban! It also plays MP3 files and will read 2 sub directories into the folders on your flash drive. Pretty nice MP3 player and fm transmitter for the money. I tested this in-car fm transmitter / mp3 player with the Kingston DATA TRAVEL series 16 gb mentioned above. 16 GB will hold ruffly 3600 songs. DataTraveler can hold just about any file you can think of term papers, theses, digital images, spreadsheets or other important documents. It works with virtually any computer with a USB port. Whats nice about USB flash drives is if you ever purchase a new radio for your car or truck many of the newer radios comes with a aux usb interface and will work just like a mp3 player! Let us know if you have any better set ups please! For the dollars spent this is as cheap a in-car fm transmitter you can find. And since it’s through amazon you know you can’t do wrong. minje dosn’t work… the screen is blank and it dos’t work???? what could be the problem??? Its a cheap device.. you got your money out of it.. mine lasted about 12 months. A friend of mine got a Livio Radio CA001 and it’s working great of him well over 12 months now. Update November 28th – now just over a year later all the in car FM transmitter we purchased for our MP3’s have crapped out. Complete POS if you ask me. Devices should last more than 18 months. For this reason I’m not recommending them, at all.